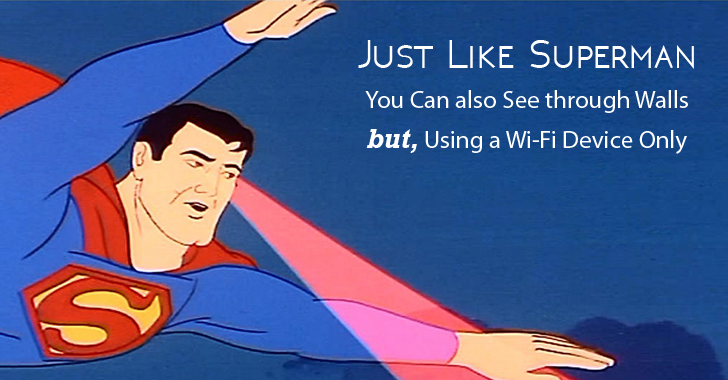 Forget about Superman's X-rays vision, you can now see through walls using WI-FI device only. Scientists at MIT's Computer Science and Artificial Intelligence Lab (CSAIL) have developed a device that uses WiFi signals to effectively see through walls and other obstacles, and identify which persons are standing behind it. Dubbed RF Capture, the new system is enhanced version of their previous methods of capturing movements across a house – technology used by mothers to see their baby's breathing and firefighters to determine if there are survivors in a burning building. How Does RF Capture Work? The working of RF Capture is actually quite simple and relatively straightforward. RF-Capture works by transmitting wireless signals that, upon hitting a person standing behind a wall, are reflected off various body parts and then back to the device for analysis to piece together the whole image of people. The device is capable not only to make out a person's chest, head, arms and feet, but also to distinguish between two different individuals and even various types of postures. When tested, RF Capture was able to distinguish between 15 people through a wall with nearly 90 percent accuracy, as well as trace letters a person wrote in the air from behind a wall, the team said on its website. You can watch out the video given below that shows how researchers captured consecutive time snapshots, before constructing the human silhouette. Researchers are excited about the future applications that this kind of wireless technology could provide. "We are working to turn this technology into an in-home device that can [be called] 911 if it [is capable of detecting] that a family member has fallen unconscious," MIT professor Dina Katabi said in a statement. "You could also imagine [the technology] being used to operate your TVs and lights, or to adjust your [temperature] by monitoring where you are in the house." RF Capture could also have applications in motion capture, allowing filmmakers to dispense with those silly sensor-covered suits currently in use by performers for doing special effects sequences. The current model assumes that the subject of interest starts by walking towards the device, hence allowing RF-Capture to capture consecutive RF snapshots that expose various body parts. While the system is able to track individual body parts facing the device, like a Palm writing in the air, it is unable to perform full skeletal tracking. It is because not all body parts of a person appear in all RF snapshots. However, researchers believe "these limitations can be addressed by [their] understanding of wireless reflections in the context of computer graphics and vision evolves." The research paper, entitled 'Capturing the Human Figure Through a Wall' [PDF] will be presented by the MIT researchers at the SIGGRAPH Asia conference in Kobe, Japan in early November this year.